I have started a plane collection. 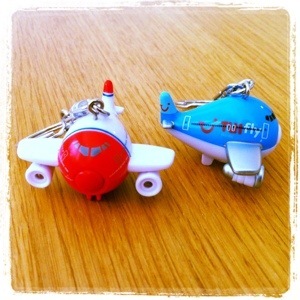 When we went to Spain in February I bought a key chain with the Norwegian plane. Now when we went to Crete I bought a plane from TUI. I hope that the next time we travel we fly with another company and that they, of course, sells the plane then. When we went to London by SAS they had a plane in their brochure but it was only available to purchase on charter flights. Bummer! They are soooo cute. 🙂 Not childish at all!